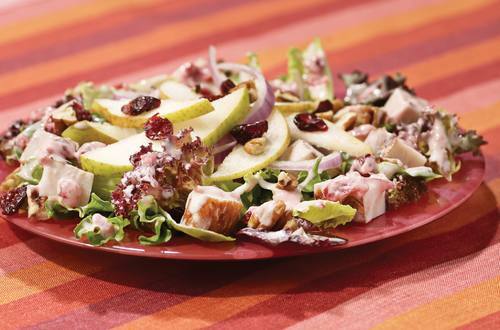 "Blushing Cranberry, Pear & Turkey Salad | Hellmann's US"
1 Combine Hellmann's® or Best Foods® Real Mayonnaise and cranberry sauce in medium bowl; set aside. 2 Combine romaine, spinach and turkey in large bowl. Just before serving, toss with mayonnaise mixture. Top with pear slices, pecans and onion. Garnish, if desired with dried cranberries. Note:  Recipe can be doubled.